Does your dog run out the door and will not come back for anything? Does your dog take off to chase a squirrel or rabbit? Has your dog gotten out of its collar or harness? 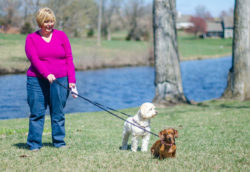 Has the leashed slipped out of your hand and you could not get your dog to come back to you? This is one of the most terrifying things that can happen to a pet parent. Believe it or not, you can teach your dog to come back to you in an emergency situation. First you will need to choose a word for your emergency recall that you do not use in any other situation. In my training I use the word “Jackpot”. Next have some yummy treats, chicken, cheese, etc. You want it to be something that your dog loves, but does not normally get. At first just say his name and then “Jackpot” and reward him with lots of treats. Extend your distance from him and say “Jackpot”. Tag team back and forth with a friend. Then do the same thing when he is in the other room. You also want to hide from him and say “Jackpot” so he has to find you. The reason for this is if he takes off and goes around a corner where you cannot see him, he will come looking for you when you say “Jackpot”. Practice when he is outside in the backyard. You can use a 20- 30 foot leash to practice in an unfenced area. Always say jackpot really excited. Granted you will not always have treats available if your dog escapes. Use the word “Jackpot” and then when he comes back give him lots of love. Never scold him when he comes back to you. It is equally important to teach your dog to stay back when you open a door. Find a special place for him to sit when you will be opening the door. You will need to teach your dog to sit first. Once he has mastered sit, teach him to stay. Practice sit and stay in his special spot. Once he is staying in his spot, crack the door open a little bit. Close and go back and reward him. Keep opening the door a little further. Take it slow and go back and reward him. Always be prepared to shut the door quickly or block him from going out. For safety you can have a leash on while working on this exercise. This training could save your dog’s life. If is very important to practice all of these exercises daily. Hopefully you will never have to use your emergency recall, but it is good to teach your dog to come back to you in an emergency situation.